Ah’Jad the Evil Dwarf tells UN: “It’s the decline of the American Empire” | the "silent" majority no more! ← From Fox News – “Break the Fast” with Ah-Jad? We say: Throw the bum OUT of the Country!!! 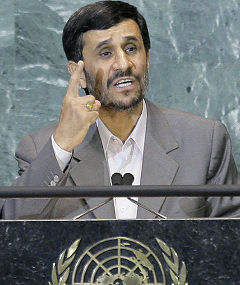 Tuesday afternoon Iranian president Mahmoud Ahmadinejad addressed the 63rd session of the United Nations General Assembly. Here are some of the appalling statements made by That Evil Dwarf! Accused the U.S. of being a bully. Accused the U.S. of trying to colonize Iraq. Blamed “Zionist murderers” for everything from the plight of the Palestinians to the Russian invasion of Georgia. Thursday a pathetic assemblage of “peace-loving” ARROGANT secularists who masquerade as “People of Faith” will morph into clowns Fellini would love as they praise this “Son of Sam” and then SIT DOWN TO SUP WITH THE DEVIL !!! Some days we just wanta “Stop the World..and Get Off!” …. it’s no fun anymore….